Great. Maybe he can hop off the pavement on his road bike and hit some singletrack. But not all of us can plow through loose gravel on 25C tires pumped to 110 PSI without winding up on our heads. I see his point, though. Many of us cyclists are too quick to buy new stuff when we can re-purpose old gear. Here’s how to figure out once and for all the Gravel Bike Versus Road Bike conundrum. My road bike was a 1999 Lemond Zurich. Beautiful Reynolds 853 tubes welded in the US. Smooth riding. Strong. Relatively light. But I got my money’s worth out of it. So if you have 10 or more years on your road bike, maybe it’s time to treat yourself. There’s nothing wrong with that. Age plays into the tire clearance question, as well. My Zurich had rim brakes, so that limited the size of tires I could jam in there. 28c, tops. Most gravel bikes are rolling 32c and up. 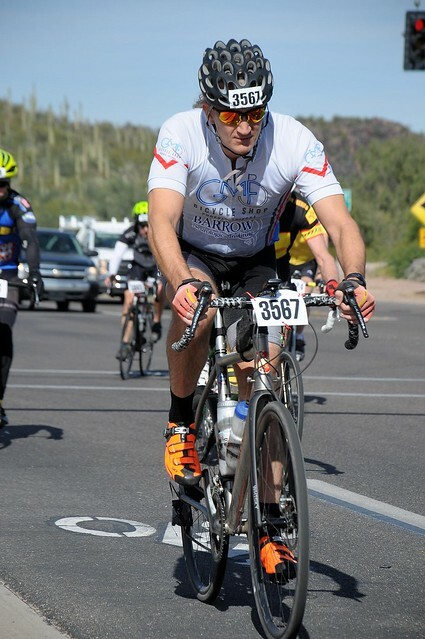 I trained on 40c tires from April to November before I popped on a set of 30s for El Tour de Tucson (where I broke my previous record by 30 minutes). Enormous gravel tires will slow you down if you’re riding on the road most of the time. Don’t worry — ride ’em until they’re worn out, and replace them with skinnier gravel tires in the 30-32c range. I love the disc brakes on my mountain bike. And there are times on long descents when my old rim brakes felt more like I was melting the pads than actually slowing my roll. Adding discs to a frame like my Zurich would’ve been possible, but not cost effective. I’d have to strip the components and paint, turn it over to a welder, repaint it and then rebuild. In 2018, I set my PR on a gravel bike at El Tour De Tucson. For stability, there’s no question about gravel bike versus road bike. When I plow into softer or rockier ground, my Lynskey Urbano doesn’t twitch thanks to its relaxed cyclocross geometry. Lemond made road bikes with steep road-racing angles, and they never fared well on soft or loose surfaces. Do some number-crunching over geometry. Wheelbase and standover will reveal quite a bit about how a bike will fit you if you can’t test ride. Still Want to Convert Your Road Bike? Do This. 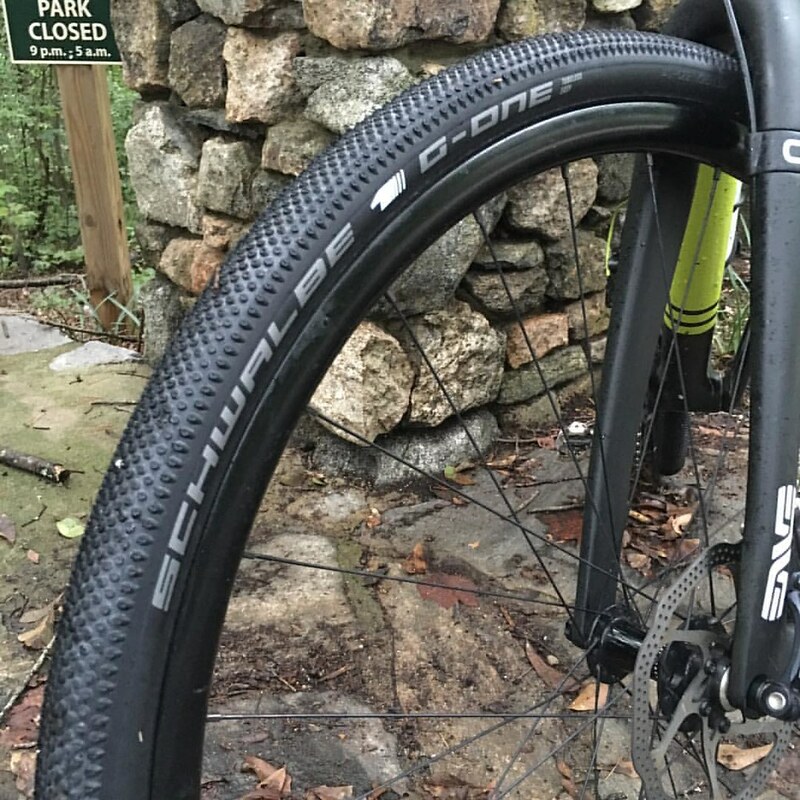 Go Tubeless: Tubeless tires are way better at shrugging off flats when use them with sealant. Pluck the thorn or other foreign object out, spin it and add more air. Done. This is a super-awesome gravel tire mounted on a set of tubeless rims. Get a Flared Drop Bar: A flared drop bar will make you way more comfortable. I was amazed at how much better I felt on long rides, even when I never left the pavement. In fact, I’d say most road riders should consider one. Bigger Tires, Lower Pressure: Jam on the biggest tire you can, and take some pressure out of it. Drop 20 PSI from your usual pressure and see how it goes. Experiment a bit. Previous This is a huge electric vehicle charging problem. Here’s how to fix it.